Unfortunately you can't really see in this pic that it is snowing/blowing and that Sam, Lauren and Finn are standing in a big snow bank. JO and Stefan are missing...JO has been sick since she arrived last night and Stefan hadn't arrived yet. We quarantined JO and as of right now she is feeling MUCH better. She ate dinner and is getting ready to burn it up in her 1500 tomorrow! In Saskatoon terms, it was downright balmy out today! It actually went up to about 2º! Tomorrow it is supposed to go down to -21º with a high of -6º, good thing your kids don't play soccer! 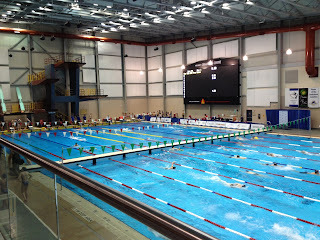 Here is a shot of the pool, the kids say they like it so we might see some fast swimming from them! Today they swam twice, did homework, rested and shopped for their snacks. After this morning's practice they came home for a 'cook up' of French toast, fried eggs, sausages and fruit. Tonight was Caesar salad with spaghetti and meatballs. This was the road on our way home from the pool this afternoon...no, I didn't take it while driving, my co-pilot did! Everyone one seems to be revving themselves up for the start of the meet as they are all tucked up in their rooms already. Phew, I get to lie down for awhile! That's before I get back up to marinate the chicken for tomorrow's Greek night.